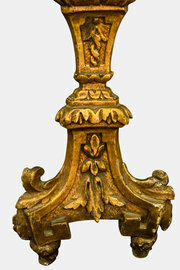 DescriptionA pair of Italianate 18th Century altarsticks of triform section. The foliate cast stems descending to spreading triform bases on toupie feet. Recently rewired to house electric light bulbs.